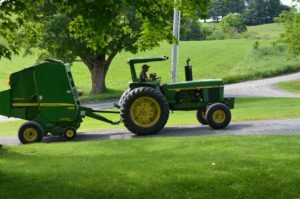 Set in the pastoral hills of Pomfret, Vermont, Cloudland Farm is a diversified working farm which has been in the Emmons family since 1908. The spectacular views on the four-mile drive up the scenic Cloudland Road are part of the Cloudland experience. At the farm, which is on both sides of the gravel road, visitors are free to take photographs of the farmland and any of the animals that may be in view from the road. This may include our black Angus cattle and calves, horses, laying hens, Cornish-cross meat chickens, turkeys, the barn cats or the pigs. For those who enjoy hiking, the Appalachian Trail runs through the farm property and is open to hikers every day of the year. 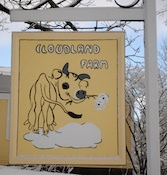 If you would like to take something home with you from the farm, the Cloudland Farm Market offers for sale Cloudland’s delicious natural Angus beef steaks, ground beef, roasts, beef sausages, beef jerky, pastured pork, and pickles. The Farm Market also offers local maple syrup, local cheeses, Vermont teas, Vermont sodas, and handmade goat’s milk soaps, as well as an assortment of cookbooks, wooden cheese boards, and Laura White’s pottery. The farm market is open on Thursdays from 10 to 3 and on Fridays and Saturdays from 10 to 5 or by appointment. 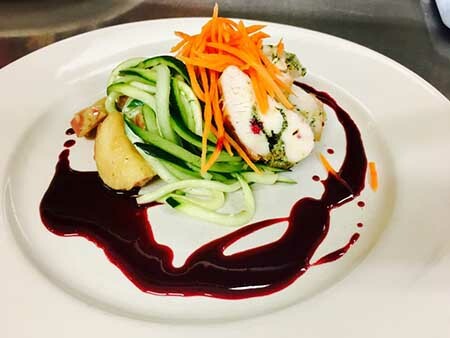 We also invite you to come for dinner at our on-farm restaurant to experience true farm-to-table dining. Chef Ira White creates tantalizing cuisine using fresh, local ingredients from Cloudland and other local farms — a feast for both eyes and palette. Dinner is served on Fridays and Saturdays by reservation only.